One Community is celebrating its 40th anniversary this year with an event each month and a set of challenges to engage its supporters. The March event was a Mascot March down West Street in Fareham, led by the Mayor and Mayoress of Fareham, Cllr Geoff Fazackerley and Mrs Tina Fazackerley, on Saturday 24 March. 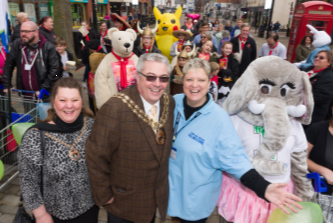 The parade of charities’ mascots was aimed at raising awareness of the work they do in the borough. 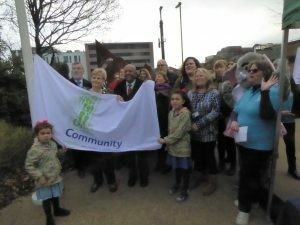 On Saturday 4 April, the Mayor of Eastleigh, Cllr Maureen Sollitt, and Chair of One Community Professor Sri Kandiah, raised the One Community flag in Leigh Road Recreation Ground, in front of a crowd of dignitaries, staff, volunteers and Friends of One Community. The One Community Young Carers Choir entertained the crowd and both the Mayor and Professor Kandiah spoke about the work and spirit of One Community.